Are you curious to know how we brew our beer? Join us on a guided tour and you will learn the step-by-step process of beer brewing and some interesting historical facts about our brewery. At the end of the tour you can taste a wide range of our brews and non-alcoholic drinks. What is the lifecycle of beer? Of course, it all starts in the barley fields and in a strong passion for beer. In Bauska beer has been a firm favourite since the 16th century when it was brewed for the residents of the castle, mainly – for celebrations. The foundations of the current Bauska brewery were laid in 1979, and by 1981 the first bottles of in house brewed beer by Kārlis Zālītis reached beer lovers all over the country. The popular favourites Bauskas gaišais and Bauskas tumšais beer were soon added to the range. The tour of the brewery starts in the boiler room, where you can taste grains of barley malt which is the base of the modern Bauskas alus. One can also learn how mash is made as it continues on its way to the fermentation room. 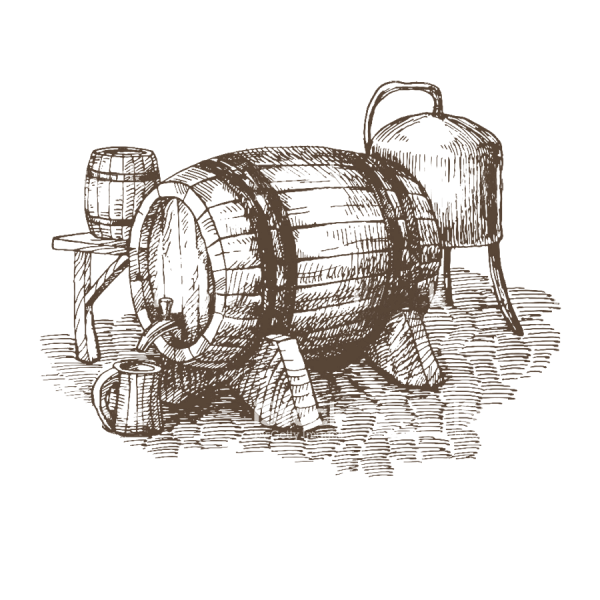 This has long been the pride of the brewery and the basis of its tradition, as Bauskas beer is fermented in open tanks. Later the beer is transferred to the cellar where the low temperatures allow it to acquire aroma, colour and flavour. After 42 to 45 days the cycle of beer brewing is finished. A tour of any brewery would not be complete without tasting some of the finished products! Bauska’s beer tasting room is a part of its heritage. Its interior has remained largely unchanged with all the aesthetics and pomp in the Soviet era style. In addition, our guests can visit the old tasting room – where 30 years ago only the most prominent of guests were allowed to visit. We offer you to visit the “Bauskas Alus” brewery with a guided tour (for a group of minimum 10 people) conducted in Latvian and Russian languages every day including Saturday and Sunday. Please book your tour in advance. The first Saturday of every month you are welcome to join individually a guided group tour which starts at 12:00 and 15:00 in Latvian language. The tour lasts 90 minutes. Paldies, Jūsu peiteikums ir saņemts. Tuvākajā laikā mūsu pārstāvis ar Jums sazināsies, lai noprecizētu apmeklējuma detaļas.